Become the prophesized hero and bring hope to a doomed world in MOBIUS FINAL FANTASY English version. If you've played FINAL FANTASY 7 on android then you'll love this one. 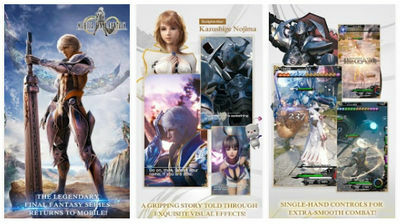 Mobius RPG brings even more realistic graphics, a strong story, and updatable chapters. Other features include a reinstated 'job system', a new RPG turn-based battle system, and new character customisation with each chapter. In this first chapter you play as a hero who arrives at the right place at the right time. Standing amongst others, you could potentially be the hero Palamecia's ancient prophecy was talking about. - Experience an exciting rpg story! Each chapter release will be accompanied by grand in-game events adding new playable content and exciting customization items for your character! - New battle system for mobile creating highly tactical battles where each action flows into the next, chaining attacks and abilities!- FINAL FANTASY's vaunted "Job System" returns in Mobius Mod 1.6.100. Enjoy unlimited character customization combinations (classes and abilities). Choose your job, build your "deck," and destroy your enemies! - Everyone's celebrating the Warrior of Light story finale! That special region has returned! - FFXII Collaboration Event Returns! Become a Sky Pirate and battle against the Mandragoras!? FFXIIs Angel of Death has descended in multiplayer! He initiates various attacks depending on your deck level! Install APK, Download data files ingame and play. - To login to FB, Remove your Facebook app and login again. - If you have Root and want to sign into Google, use UnSigned version (must know how to install it). - Use IDM+ to download the game from GDrive at high speed and with no errors.